Welcome to the website of award-winning author Corey Michael Dalton. Here you can learn all about Corey's current writing projects, check out his bio, read samples of his previous work, peruse articles about him, read interviews with him, and find out how you can contact him. Corey and his co-author, Bryland Sutton, recently released a middle-grade fantasy/adventure novel called The Empress of Otherworld through First Circle Press, which you can order from Amazon now! The book is about a boy named Hap who stumbles into Otherworld, a fantastic realm made up of countries including Oz, Neverland, and Wonderland. 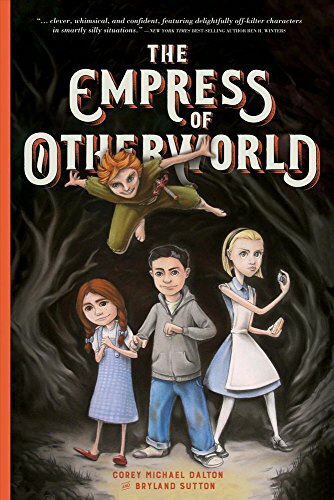 In this strange new world Hap must join forces with three super-powered kids—Dorothy Gale, Peter Pan, and Alice Liddell—to overthrow Prospera, the ruthless Empress of Otherworld. As Hap and his new friends fight their way through spider-vultures, trollsons, and the shadowy assassin Peter Panic, he discovers a possible (but dangerous) way home as well as clues to unlocking his very own super-power. Check out Corey's interview on WISH-TV's Indy Style about The Empress of Otherworld here! Read an interview with Corey's co-author, Bryland Sutton, here! Discover how Corey's hometown newspaper covered the novel's launch here!